The hacksaw of today is a far cry from the simple hacksaw designs of yesteryear. Manufactured with lightweight alloys, today’s best hacksaws are designed for higher dependability, straighter cuts, and dependable results. A hacksaw is essentially a metal-cutting version of of a bow saw (wood-cutting) but with more teeth for cleaner cuts. Professional craftsmen rely on names like DeWalt, Lenox, and Klein, and our picks for top rated hacksaws provide a great example of why those companies are leaders in their field, both at home and on the job. Hacksaw vs Bow Saw – What’s the Difference? The DWHT20547L features a blade that pivots from 45 to 90 degrees, giving you access to flush cuts without having to switch different saw types. The high tension blade is designed to be tensioned up to 330 pounds, so you get a strong cut without wobbles and no fear of snapping the blade. With its low profile frame, the DeWalt reaches into narrow spaces and stands up to hard work. Since the blade attaches to the very front of the frame, you can get into small locations and a longer reach. The 5-in-1 sounds gimmicky but is actually quite handy. Weighing less than two and half pounds, this DeWalt hacksaw is a lightweight, useful tool for any home enthusiast or master craftsman. With so many distinct configurations available, it can lighten your load by reducing the number of saws you carry. DeWalt is one of the top rated manufacturers of hand tools, and they have put their design experience to good use with the DWHT20547L. It is sturdy enough to take just about any handling, and dependable enough for amateur craftsmen to do a professional job. While this particular saw is made in China, is has typical DeWalt quality. It may be a little heavier than you prefer, owing to to different capabilities, but even the extra weight gives you a sense of productivity when it is time to go to work. This slightly unusual-looking hacksaw uses an I-beam construction to provide up to 50,000 psi of blade tension. The included blade is 12-inches with 24 teeth-per-inch to ensure a clean, straight cut. The handle is rubberized for improved handling in wet or cold environments. A reciprocating blade can be added to the front to turn this tool into a jab saw, and up to five additional 12-inch blades can be stored in the I-beam for quick replacements on the job. Despite the toy-like color appearance, this hacksaw is made of sturdy cast and extruded aluminum, making it lightweight and durable. The ability to convert this saw makes it twice as valuable without raising the cost. Owners also note how comfortable and rugged the saw feels when in use. Much of the negativity surrounding this product has been addressed and remedied by Lenox, although some of the older defective models may still be around. Issues mainly revolved around the tension knob and pins, which were known to break in older versions. The knob can still be knocked out of alignment, but the overall design is far sturdier now. Like the other hacksaws reviewed, the frame is Chinese made but at least the Lenox’s saw blade is made in the USA. 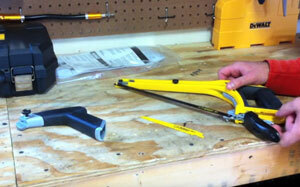 The Klein Tools 2-in-1 is an innovative step forward in hacksaw design that you can feel from the very first use. A 6-inch reciprocating blade with 24 tpi that is designed for bi-metal cutting in restrictive locations. The aluminum handle includes a patented soft grip that ensures a tight grip without muscle fatigue or blade binding. While most Klein products are made in the USA, the hacksaw is an exception (made in China). While appearing to be built to normal Klein Tools standards, many users are surprised when they learn where it’s made and (unfairly?) rate it a bit lower than other Klein products. The frame design is not well suited to close quarters, but is tapered to reduce the clearance required. Aside from that, you will not have much to complain about, and there is more than enough to appreciate. One of the biggest drawbacks to hacksaws is the inability to work in tight spaces. The 48-22-0012 solves this issue with a short 5-inch handle and ability to partially retract the 10-inch blade. A tool-free blade changing design allows quick replacements, while the ergonomic plastic handle’s rubber overmold makes for a superior grip. The quick-release handle is just one of the winning points of this saw. Despite the small size, it can cut through a wide range of materials smoothly and is highly durable (like most Milwaukee tools). Best of all, its compact size means you can easily fit it into your tool belt. Due to the fact that this tool is designed for tight spaces, you may have difficulty making it work for larger projects. This is especially true when working with larger curved surfaces, as a screw bisects the working area of the saw blade. This high-tension 12″ hacksaw is designed to make your job as easy as possible and can hold a blade with up to 400 pounds of tension. It has two blade positions (straight and 45 degrees) to aid in cutting flush against surfaces. You can store up to six additional blades in the main beam for those times when the included 12-inch 18 TPI blade won’t work. In addition, the nonslip rubber grips are located on both the handle and front frame, making two-handed operations run far smoother. Overall, you can expect plenty of comfort and convenience using this saw. The blade is made of a composite material which some owners say cut better than your usual carbon steel blades. Many (including us) place the “cheap” Tekton 6823 on the same level as more expensive models by other top name brands. And in the event of an issue, Tekton’s customer service is known for its dedication to making their consumers happy. It should be noted that this saw has a cast aluminum frame which can be prone to damage when working with particularly difficult materials. That’s not to say it isn’t a great saw for the price, but be aware of the limitations of an aluminum saw when preparing for a job. While both have a somewhat similar appearance, these two tools have completely different functions and make poor substitutions for each other. Knowing these differences can save a lot of time and effort when on a job. Bow saws get their name because of the curved frame. These saws use blades with crosscutting teeth for quick and dirty cuts. They’re ideal for felling small trees and performing a number of outdoor and camping tasks. They’re terrible for finishing, as the blades leave very rough edges, and the bow design allows much deeper cuts than a hacksaw’s straight framed designed. Meanwhile, hacksaws are one of the most common types of saw out there and can be found in most workshops or contractor’s toolkits. They have a straight frame to allow for high tension and a better grip, while the blades have finer single-direction tooth counts for a clean, crisp cut. With a hacksaw, you will often change the blade to match the material you’re working with, allowing for a wide range of tasks. I got one of the DeWalt 5-in1 hacksaws. Pretty sturdy. I use a Klein Tools slotted screwdriver to disassemble it to use it as a jab saw and feared I’d strip out the screw so I went ahead and picked up a Klein tools jab saw. Great saw though. Again, more useful as a 4-in-1 hacksaw than the fifth use as a jab saw.